Gov. Gavin Newsom traveled to San Diego Thursday to thank local political and community leaders for voluntarily organizing to help refugees from Central America. “This is a community that has stepped up,” said Newsom, who cited a “remarkable collaboration between Democrats and Republicans” in San Diego. 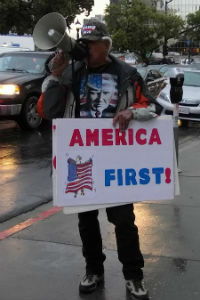 Newsom spoke two days after the Board of Supervisors voted to lease a vacant downtown property to Jewish Family Service of San Diego to temporarily house women and children released by the federal officers with nothing but GPS tracking monitors on their ankles. 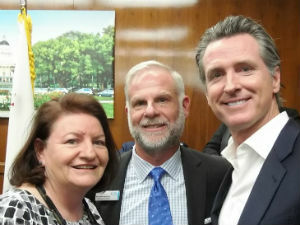 Jewish Family Service CEO Michael Hopkins (center) with Toni Atkins and Gavin Newsom. Since October, the San Diego Rapid Response Network, a coalition of Jewish Family Service and other organizations, has been providing food, shelter, clothing and travel arrangements. More than 5,500 people have been helped. The Governor was joined by Supervisors Greg Cox and Nathan Fletcher, Sen. Toni Atkins and Assemblymember Lorena Gonzalez, as well as leaders of Jewish Family Service and the American Civil Liberties Union, to coordinate efforts to provide relief and humanitarian aid to the asylum seekers. 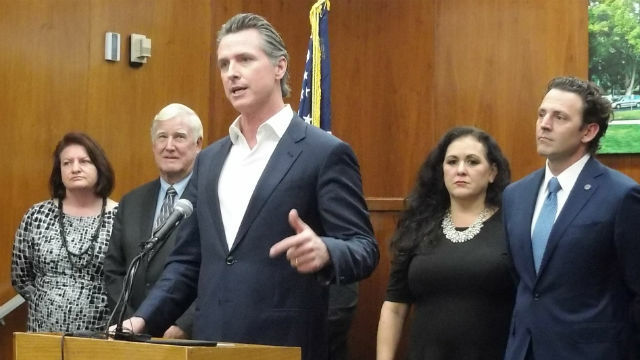 Newsom’s first budget includes $25 million to assist qualified community organizations and nonprofits in providing these services, and Gonzalez announced the Assembly would vote Monday to make $5 million available immediately. Fletcher, who with Cox led the effort to find county space, said the federal government is ultimately responsible, but San Diego had to step up. “We will not let the Trump administration’s immoral and indefensible immigration policies detract us from doing something right,” he said. Cox said the county’s vote Tuesday to provide a temporary facility through the end of the year is important but only a starting point. A new federal policy of keeping asylum seekers in Mexico until their case is heard could stem the flow, but will probably face a legal challenge under the current federal asylum laws. Newsom toured one of the Rapid Response Network shelters in November, before he took office, and it made an impression. “Had the community not organized, the State of California, with all due respect, would not be here,” said Newsom.